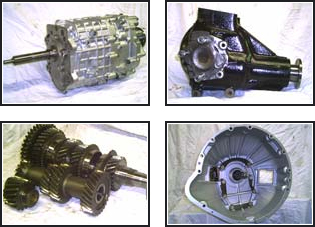 We repair and recondition manual gearboxes and differentials. We have been in business since 2002 and are located in Worksop, Nottinghamshire. It is easy to find us either from junctions 30 or 31 of the M1, or from the A1. Please Note - we would appreciate no enquiries regarding automatic transmissions, as we ceased dealing with them in 2007. Please take a look at our FAQ page for more detailed information about the services we provide. Customers come to us from all over the UK, as well as Europe, the USA, Australia, New Zealand and Hong Kong. So don’t hesitate to get in touch; we always try our best to help out every customer. One of our specialities is being able to fully recondition BMW, Jaguar and GM Getrag gearboxes, which are classed as “not rebuildable” from the factory. This specialist knowledge also extends to Jaguar E-Type, Overdrive and Moss ‘boxes. Please take a look at the “Specialised” part of our About Us page for more information. Although we can work on all everyday units, our true passion lies with classic and compeition/motorsport work. In 2019 we are implementing some changes to the way we do business; some fairly big changes, others a lot less noticeable. Please read our Dear Customers page for one change we particularly wanted to explain fully. Feel free to browse our Gallery to see examples of our work or our For Sale page to see which stock units we have available for purchase. We hope to hear from you soon!